Never miss your customer voice. QRsignal provide possibility to improve service quality for the office/facilities management service. You can let your customers or employees immediately provide feedback, request service or maintenance, let you know about issues in premises or equipment. Your team can act instantly on signals received and fix issues or provide service requested. Watch short video how QRsignal can help you be more efficient. Curious about customers' case studies and examples? Learn more here! Use QRsignal to get extra-channel for the customers to receive information, order room service and give feedbacks. Most mentioned benefits of using QRsignal in hotel are possibility to promote special offers for seasonable services, upsales of additional services and fast feedback on service. 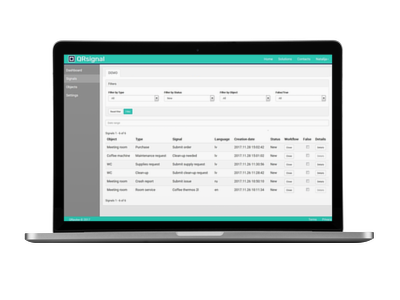 Check how QRsignal works in hotel from the customers perspective - watch the video. Cafe and restaurant use QRsignal to automate and speed-up purchase process and get extra-purchases. There are two main options how QRsignal can be used in cafes or restaurants: self-service, or as a tool for the waiters and feedback channel for customers. Explore both examples in our short animations! QRsignal can be used to provide consumer information on the product package. QR could be providing possibilities to interact with the seller or delivery company: provide feedback, rate seller, post product review, evaluate delivery service, get information on return or guarantee. Quite often customer satisfaction on service depends on ability to react fast. That's exactly what QRsignal can help you to improve - provide simple QRsignal features for your vending machines and make your service effort much more savvy and lean! Watch the video to explore an example. You can stay in control and analyse received signals, thus eliminating poor service reasons, know improvement possibilities and customer needs, evaluate your business weaknesses and strengths, make your customer happy and willing to return. With the QRsignal you get the possibility to act on what really matters for your customer and your business. Want to know more about QR code? QR code is a machine-readable label which consists of an array of black and white squares, typically used for links to be used by the smartphone. QR stands for Quick Response - it's really quick to get and visit the link just by scanning the QR code wherether it is located. To be able to scan QR code with your smartphone, you need to have QR code reader app on it (download any QR scanning app to your smartphone if you don't have it yet). To scan a QR code simply open the app, point the camera of your smartphone at the code, and follow the link to access the information. QR codes can be used in offices, hotels, stores, restaurants, assembly lines, on products, buildings, equipment or business cards - giving more information in less space. You can use QR code to enable customers, visitors or employees to order service, report problem, give feedback, check-in action, receive information, or simply visit web page. Involve your customers and visitors with possibility to provide feedback, order service or give a signal what should be fixed any time they want or have a need. Get promoted for the best service! It's really simple - register the object, set up the actions, print and place QR code. That's it - ready to use! No need for your customers and visitors to download or install any software. No worries on accessing restricted information - manage users both for your employees and vendors or service providers. There is no need for customers and visitors to provide any sensitive data. No need for specific equipment - smartphone is enough! Your customers can scan QR code and give signals, your team can receive notifications & act on signals with just their smartphone.